Sometimes karma comes back to bite you, and one guy wasted no time in making sure a thief got what was coming to him – destroying his bike after an attempted robbery. 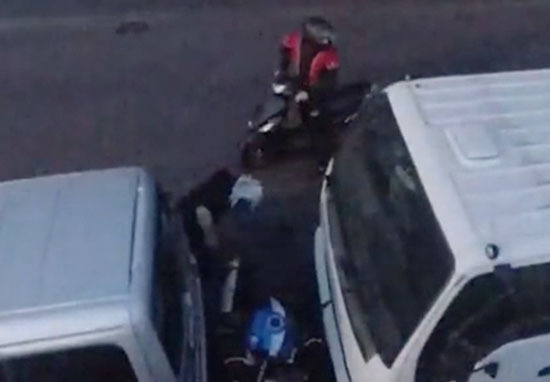 CCTV footage shows two criminals pulling up by a parked motorcycle and getting off their bike, ready to put their illegal plan of stealing the motorcycle into action. Before they had chance to steal the bike however, a passerby appeared and did what he could to stop them. The man in the silver car arrived at the scene just moments after the criminals, and after realising what they were up to, he got out of his car to investigate. As he approached the thieves, one of the men threatened him with a hammer. You can see him walk towards him before raising the weapon menacingly. Not wanting to get hurt presumably, at his point, the driver gets back in his car. 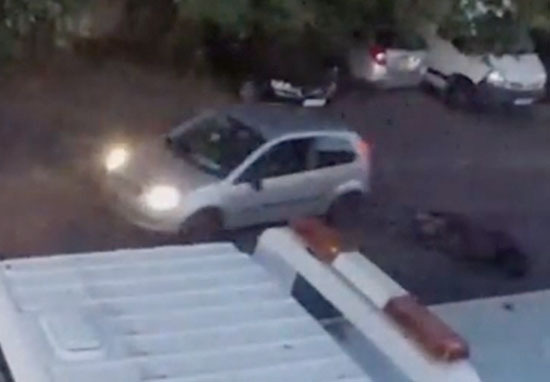 The thief continued to threaten the man by whacking the car with the hammer, and while he probably made a few dints, the hits actually did the driver one small favour. As if the universe wanted to reward driver’s heroic intentions, the hammer’s work made the silver car’s one broken headlight come back to life. The thief continued to attack the car until the driver sped out of the view of the camera, into the now well-illuminated night. The two thieves appeared to give up on their robbery attempt. One ran away while the person with the hammer turned his bike around. Seeing he was about to get squashed, the thief abandons his bike and leaps out of the way of the car. The vehicle hits the bike and sends it skidding across the ground. The criminal makes one last attempt to get his bike, but eventually gives up on it and runs away. The driver of the silver car got out and assessed the situation, before making a call, while looking around to see what the thieves had actually done. The criminal got what some might argue, he deserved. 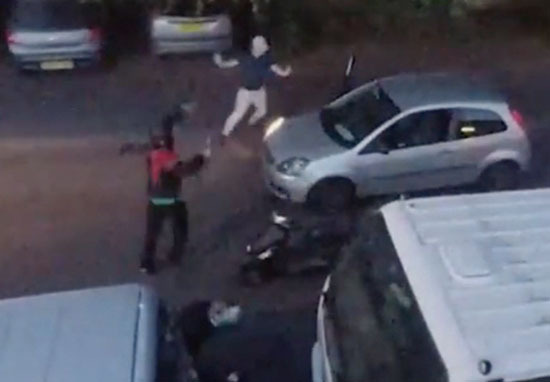 If he thought he could steal someone else’s motorbike, then he certainly didn’t deserve his own! After the video was shared online, many people commented on what a hero the car driver was. Can we have a whip round to pay for this guys repairs plus a curry for him? Hopefully the two thieves were arrested after the heroic man’s attempts to stop them and he received the praise he deserved. At least he got two working headlights out of the situation!